Now for some real-world testing, with a set of real-world data. This test data set consisted of some large media files of 800MB to 3GB each, several hundred photos and small videos from my camera and quite a few directories of small files such as documents and application installers, totalling around 8.2GB. This data set was first copied to each drive from a much faster PCIe SSD. Then, I moved the directory back to a different destination on the PCIe SSD. In each case I simply timed the copy operations with a stopwatch until the Windows copy dialog closed. It's a low-tech approach but will give us a feel for the real-world usage of the drive. Each test was repeated twice and the times averaged. Again not much difference but slightly in favour of the newer T-Force drive. I think we can be reasonably content that the T-Force drive isn't going to be an issue performance-wise. It's demonstrating close to the advertised speeds and seems to cope with real-world usage just fine. It's hard to capture the effect in photos and videos. In particular, they don't really show how bright this unit is. 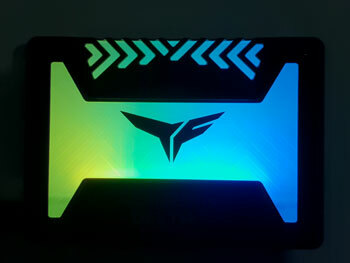 It would definitely cast a glow across the inside of your case in normal room lighting. You've probably guessed by now that I'm not a huge fan of the RGB trend but I actually don't mind the effect of this drive. It certainly passed the "wife and kids" test as well - they were very impressed by it. 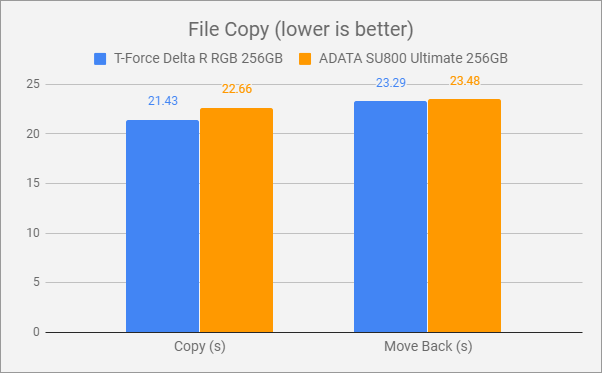 A quick look at pricing shows this drive at a small premium above other 256GB drives, but that's not a particularly expensive segment of the market anyway. 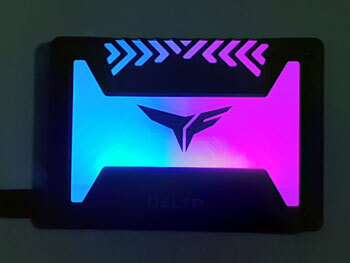 If you added in whatever else you'd be buying to get the RGB effects happening in your case then you're probably not really overpaying too much for this unit to get an SSD and a light show. Team Group offer a 3-year warranty on this drive too which is nice. This struck me as a bit of an oddball product at first, but it's grown on me. 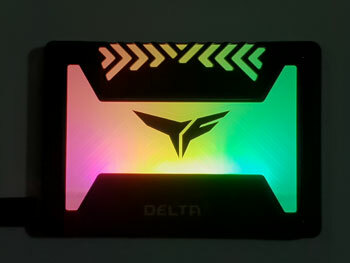 As an SSD it performs as advertised, which seems fine for a SATA unit. It's from a well-established manufacturer and has a 3-year warranty for peace of mind. 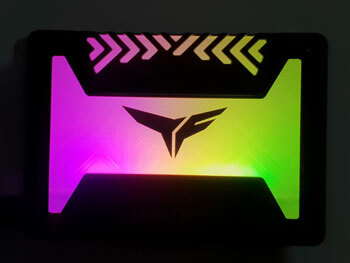 The LEDs aren't controllable, but they produce a very nice lighting effect and certainly add a unique vibe to your case. So overall I'd say this is a good choice if you're looking for something a bit different. Feel free to discuss this review in this thread!